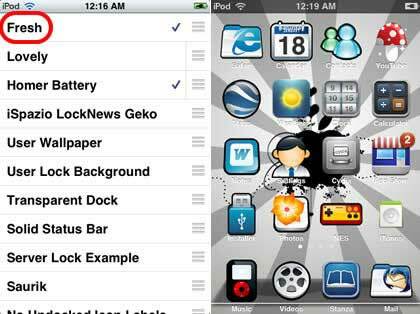 If you are boring with your black iPod touch theme, this step by step guide will show you where to download free cool iPod touch theme and how to customize your iPod touch theme, let your iPod be special and personal. I google search and found some free cool iPod themes and iPhone themes from this website, you can go and choose the one you link. In oreder to put theme on iPod, you need WiFi connection and Winterboard app. WinterBoard is the app you need to manage your theme files. You can easily switch between different themes. Step1. Go ahead and launch Cydia then search for the WinterBoard App and install it (make sure you have WiFi internet available). Step2. In the Home section of Cydia, click the Featured Themes for starters. This is where the good looking themes are located. Step3. Under the Springboard Themes, select the one that you want. I’m going to choose Leaf. There are other themes in the Sections part of Cydia if you don’t find anything that you want. Step4. Go ahead and Install the theme. After it finishes downloading, you can exit Cydia or download more themes. Step5. To activate your theme, launch Winterboard. Select the theme you downloaded and make sure it’s the only one selected. Sometimes, a theme will have multiple elements and you must select them all to see its full effect. If you click the Home button, your iPod will pause for a bit while it loads your new theme. Step1. Download the themes you want to put on iPod to your computer at first, you can download it from the recommend site on the part 1 of this guide, or you can download from this iPod touch theme website. You will usually get a .zip file with .png files and an icon folder inside the root folder. Extract the folder and rename or append .theme on the folder name. I’ll rename my folder into Fresh.theme. Step2. Connect your iPod to your PC and run DiskAid. Go to the Root Folder (select from drop-down list). Click OK if it asks if you know what you’re doing. Step3. Navigate to Library > Themes. Finally, drag and drop your theme’s folder into that location. That’s it. To activate your theme, launch WinterBoard on your iPod Touch and select the theme that you uploaded. Press the Home button and wait for your theme to load.